Eloise M. Bowen 43N of Snellville, Ga., on Sept. 29, 2016. Laurette Colley Raciappa 43N of Winter Haven, Fla., on Oct. 23, 2016, at 94. She served as a Navy nurse aboard the U.S.S. Repose hospital ship in the Pacific during WWII. Survivors include a daughter and son-in-law, two grandchildren, and two great-grandchildren. Harriet Owens McIntosh 44N of Lakeland, Fla., on Dec. 27, 2016, at 95. She was married to Dr. Henry Deane McIntosh for 63 years before his death in 2008. Survivors include two sons, a daughter, seven grandchildren, and two great-grandchildren. Constance (Connie) Osterlund LeClerc 45N of Longwood, Fla., on July 15, 2016, days before turning 93. As a young RN, she became a supervisor in the then new cardiothoracic surgery wing of Emory University Hospital. She also worked at General Motors' medical clinic in Atlanta before moving to San Diego, Calif. She cared for many celebrities, working for the founding doctors of Rees-Stealy Clinic, and worked in the medical center at San Diego State College. In 1958, she married naval officer Raymond LeClerc and became a Navy wife, raising two young children while her husband was on sea assignments and war duty in Vietnam. During his 30-year career, they lived in several U.S. cities and in Seoul, Korea, and Taipei, Taiwan. They retired to Maitland, Fla., where Ray died in 2002. Connie moved to nearby Island Lake and made friends with an active group of ladies who called themselves the "Rowdy Bunch." At 80, she became a first-time grandmother and was a reading tutor at Seminole County Schools until she was nearly 83. Survivors include her son, her daughter and son-in-law, and two grandchildren. Annie Laurie Sisson 47N of Greeley, Colo., on Jan. 24, 2017, at 90. During WWII, she was a member of the U.S. Cadet Nursing Corp. She trained in pediatrics at Bellevue Hospital in New York City and at Johns Hopkins in Baltimore. She also worked at Colorado General Hospital, where she met Dr. Earl Sisson. With her help, he established a pediatric practice in Greeley. She worked for 16 years at the University of Northern Colorado Student Health Center, retiring in 1989. Preceded in death by her husband, she is survived by three daughters, four grandchildren, six great-grandchildren, and two sisters. Dr. B. Jacquelyn (Jackie) Barnard 47N on Aug. 11, 2016, at her home in Kauai, Hawaii. She was a longtime Denver resident and a respected obstetrician and gynecologist. After receiving her RN degree, she moved to Denver and worked in the operating room and later in obstetrics. In 1959, she was accepted into the University of Colorado Medical School, one of two women in a class of 80. During her obstetrics and gynecology practice, she was considered forward thinking and innovative, instituting respectful changes to the way women were treated at the time. Barnard considered birth a sacred moment. After retiring in 1980, she bought land and moved to Kauai and developed a thriving farm of fruit, vegetables, and Jersey cows. She is survived by her spouse and partner in life for more than 35 years, Dr. Judy Jordan. Frances F. Stilwell 47N of Cape Canaveral, Fla., on Sept. 12, 2016, at 95. Survivors include her husband, Roger M. Stilwell, three sons, five grandchildren, and a brother. Mary Regina Messier Cumbie 48N of Daytona Beach, Fla., on Dec. 8, 2016. She was an RN for more than 65 years and worked in many areas of nursing, including pediatrics, coronary care, and intensive care. She was married to Joe Merrill Cumbie for 48 years before he died in 1996. Survivors include 10 children, 20 grandchildren, 13 great-grandchildren, and a sister. Elizabeth Edwards 48N 60MN of Greensboro, N.C., formerly of Saluda, S.C., on Nov. 6, 2016, at 89. She served as a nurse with the U.S. Navy and the U.S. Public Health Service and retired as deputy chief nurse at the National Institutes of Health in Bethesda, Md. Elizabeth was known far and wide for her yeast rolls, peach pickles, cheese strudel, cheesecakes, and the fresh flowers she grew to adorn her home. She was much loved by the family children, including her surviving nieces and nephews. Lorraine L. Spivey 52N of West Palm Beach, Fla., on Feb. 27, 2017, following a long illness. While a nursing student at Emory, she served as president of the student body and met her future husband, Myrl Spivey 51M 53MR. In 1955, the couple moved to West Palm Beach, where they raised four children. Lorraine worked as a nurse in school clinics and later co-owned a landscaping business. Active in educational, charitable, and political causes, she served as president of the League of Women Voters in Florida and on the nominating committee for the Supreme Court Justice of Florida. She remained close to her classmates at Emory, including Betty Marie Stewart 52N. "Lorraine had an amazing capacity for love—for family, friends, patients, and those who were less fortunate," Stewart recalls. "She was a role model for our class at Emory, representing so well the mantra of one of our professors: `the patient is a person—we must never forget.' 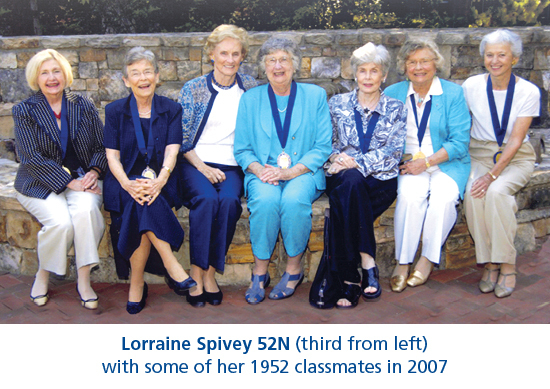 " Among Lorraine's survivors are daughters Jenny Spivy-Rachlin and Lynn Jenkins 85B; sons Lee M. Spivey Jr. 78B and Glen Spivey; nine grandchildren; and four great-grandchildren. Her husband Myrl died in 1990. Jamie H. (Mary) Crawford 55N of Perry, Ga., on Oct. 7, 2016, at 82. She worked as a public health nurse near Pine Mountain, Ga., for many years and later as an administrator for two nursing homes in Atlanta. She also owned her own business, Brigham Rehab Services, in Savannah, Ga. Survivors include two children, their spouses, and 10 grandchildren. Dr. Evangeline Black Lane 56MN of Atlanta on Nov. 8, 2016. She began her career as a Navy nurse in 1945 and went on to become a founding chairman of the nursing school at Georgia State University. She was married to Harry N. Lane Sr. for 53 years. Survivors include son Noel, grandson Harry, and many nieces and nephews. Margaret H. Allen 57N of Lawrenceville, Ga., on Sept. 25, 2016, at 81. Patricia (Pat) Maguire Stowell 58N of Atlanta, on Sept. 2, 2016, at 81. She was a nurse at Northside Hospital for 30 years. Survivors include her husband of 57 years, Robert (Bob) Stowell, a daughter, a son, and three grandchildren. Dr. Sarah Hall Gueldner 65MN of Isle of Palms, S.C., on Oct. 4, 2016, at 75. During her career, she served as professor and director of doctoral studies at the Medical University of South Carolina College of Nursing in Charleston and held appointments at Medical College of Georgia, the University of Georgia, Mississippi University for Women School of Nursing, and the University of Tennessee at Memphis. She subsequently served as director of Penn State School of Nursing and as dean of Decker School of Nursing, State University of New York at Binghamton. She traveled to Africa twice as a visiting professor and collaborated with nursing scholars all over the world, conducting research and advancing nursing education. Survivors include her husband of 49 years, Dr. Richard Charles Gueldner, a daughter, a son, their spouses, and a sister. Frances E. Carson 67MN of Nashville, Tenn., on July 28, 2016. She developed a course in pediatric nursing at Orange Memorial Hospital in Orlando, Fla. She then taught pediatric nursing at Florida State University for three years, at Vanderbilt University for 19 years, and at Middle Tennessee State University for 12 years. Survivors include her brother Hank, sister-in-law Shelby, many nieces and nephews, and many good friends. Kathy Jeanes Sauvain 69N of Greenville, S.C., on Aug. 7, 2016, at 69, following a stroke. After graduating from Emory, she earned her master's degree as a clinical nurse specialist in 1970. She practiced pediatric ICU nursing and taught nursing at the University of South Carolina (USC)-Spartanburg and the Medical University of South Carolina in Charleston. She earned certification as a pediatric nurse practitioner at the University of Virginia in 1974. After earning family nurse practitioner certification in 1999 from USC, she became the first certified nurse practitioner in South Carolina. She was the founder and first president of the South Carolina chapter of the National Association of Pediatric Nurse Associates and Practitioners. She spent most of her career with the Greenville Hospital System, taught graduate nursing at Clemson University as an adjunct assistant professor, and later worked with the late Dr. Russ Creech in developmental pediatrics. Survivors include her husband Ted, a daughter, a son-in-law, a grandson, and two sisters. Renae O. Morris 73N of Atlanta on Oct. 25, 2016. She was a retired RN and community volunteer. Survivors include her son, Cedrick A. Tucker. Anne Cleveland Goudelock 76C 78N of Fair Oaks Ranch, Texas., on Sept. 27, 2016. She was born in Boston, Mass., and formerly was married to Dr. Gary Goudelock. Caroline Rachels Church 80MN of Gainesville, Ga., on May 3, 2014, following a brief illness. She was a psychiatric nurse practitioner and had her own private practice, Restore Psychiatric Services, in Gainesville. Survivors included her husband, the Rev. Larry G. Church, a daughter, a son-in-law, two grandchildren, and four stepchildren. Kay McGuire Whitson 80N of Nashville, Tenn., on Oct. 16, 2016, at 59. Carmen G. Woodson 59C 80N of Decatur, Ga., on Feb. 17, 2017, from complications related to dementia. After graduating from high school in Pensacola, Fla., she earned an undergraduate degree in English at Emory and a graduate degree in English from Vanderbilt. She taught high school in Nashville, Tenn., where she met her husband, James Woodson. Following the birth of their son, the couple moved to Atlanta, where their daughter was born. Once her children were in high school, Carmen earned her BSN at Emory and began a second career in gerontology. She felt strongly about improving the lives of people as they aged and loved both the clinical and theoretical aspects of nursing. After retiring from the Health Care Financing Administration, she met and married Leroy (Lee) Kostner. Carmen was an avid reader, enthusiastic traveler, and highly skilled in gardening and needlework. At Emory, she served with the Nurses' Alumni Association, including a term as board president. Survivors include her husband Lee, son John Woodson and daughter Laura Woodson, three stepchildren, and her beloved cat Churchill. Patricia G. Garrison 95N of Danville, Calif., on Aug. 29, 2016. She grew up at Fort Benning, Ga., and in Walnut Creek, Calif. After graduating from Emory, she returned to California and practiced nursing at Eden Hospital, John Muir Medical Center, and Kaiser Permanente. She loved skiing and running. Survivors include two sisters and a brother-in-law. Roberta S. Immers 97N 02MN of Covington, Ga., on July 6, 2016, at 64. She served in the U.S. Army as an intelligence officer, retiring as a colonel. She then earned her nursing degrees at Emory and subsequently worked in internal medicine for many years in Conyers, Ga. Survivors include her fiancé, Michael Van Dorn, and two sisters, Jaci and Lenora. James Landon Padgett 10N of Atlanta on Sept. 17, 2016, at 30 at Halcyon Hospice of Atlanta. He was raised in Cochran, Ga., attended Middle Georgia College, and graduated from Georgia State University prior to attending Emory. He was employed by Children's Healthcare of Atlanta and the Emory Healthcare Critical Care Float Team. He also worked at Grady Memorial Hospital. Landon was a member of the Atlanta Concert Band and competed in the Sparton Races, a series of obstacle races, and earned all three medals in 2015. Survivors include his husband of two years, Tony Shiver, his parents, a sister, a brother, their spouses, two nephews, and a niece as well as Tony's family. Honor Your Classmates | Tribute gifts are an extraordinary way to honor your classmates. You can designate a gift for any occasion—a birthday, anniversary, special achievement, or the passing of a loved one, colleague, or friend. To make a gift, please contact the Office of Development and Alumni Relations at 404-727-6917.